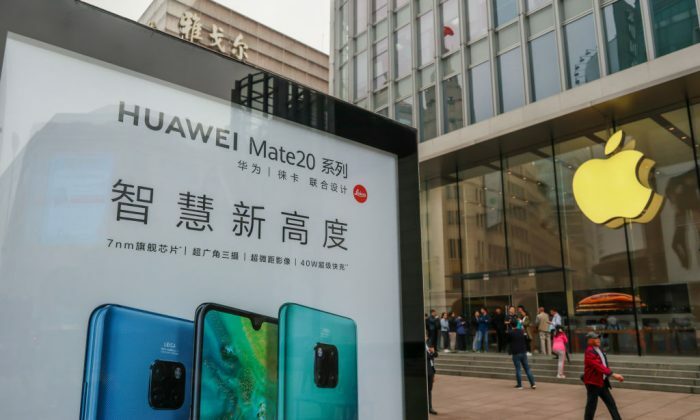 A number of Chinese companies have announced corporate policies in support of Chinese tech giant Huawei’s products while shunning Apple’s iPhones since Huawei’s chief financial officer was arrested in Canada earlier this month on suspicion of fraud. Meng Wanzhou, who is the daughter of Huawei founder Ren Zhengfei, was arrested in Vancouver, Canada, on Dec. 1 at the request of U.S. law enforcement. She is accused of engaging in activities to skirt U.S. sanctions on Iran, and faces extradition to the United States. Chinese news portal Sina, in an article published Dec. 10, listed several Chinese companies that have taken measures to support Huawei in a sign of nationalistic solidarity with the beleaguered firm, with screenshots of company directives announced after news of Meng’s arrest. In April, Huawei competitor ZTE was slapped with a U.S. export ban for violating court agreements it made after pleading guilty to evading U.S. sanctions on Iran and North Korea. The ban crippled ZTE’s business and revenue, since many of its products require U.S. tech components. The company only resumed work in July after the U.S. lifted the ban on the conditions that ZTE would pay a $1 billion fine and submit to strict compliance measures. In other announced measures, Menpad stated that the company’s future product designs would prioritize the use of Huawei’s own smartphone semiconductor chips. Additionally, the company and its employees should not buy U.S.-branded vehicles, the company said. Meanwhile, RYD Information Technology, an IT provider for construction, automobile, and aerospace clients, issued a memo stating that the company will now buy exclusively Huawei products and software. Additionally, the company provided a 15 percent subsidy for employees’ purchases of Huawei products for personal use. Yutangfu, a restaurant, hotel, and resort management company based in Zhanjiang City in Guangdong Province, said it would provide purchase coupons valued at 500 yuan (about $72.6) for new purchases of Huawei cellphones, in a corporate document dated Dec. 9. Any employee who purchases an iPhone would be disqualified from the company’s good-employee recognition, and be deprived of their yearly bonuses. Yutangfu’s document stated that, amid the current trade war between China and the United States, everyone in the company “is responsible for the rise and fall of our country.” The company’s 500-yuan payment would be effective until Dec. 31, 2019. The Nanchong Chamber of Commerce in Shanghai stated in an announcement Dec. 9 that Meng’s arrest was the United States’ attempt to curb China’s rise; therefore, Chinese citizens should support domestic brands. The announcement stated those in the organization found to have purchased Apple products would be stripped of their official positions. Additionally, the Chamber stated that anyone who decided to purchase a Huawei cellphone before Jan. 5, 2019, would be entitled to a 10 percent subsidy. On Sina Weibo, China’s equivalent to Twitter, some Chinese netizens supported the Apple boycott by these Chinese companies. Others were quick to point out the problems behind the ban.